What great news. 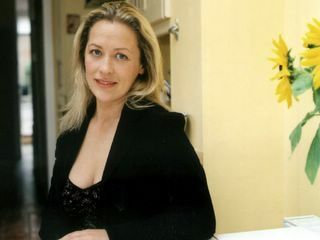 I can now combine my interests in property and dating after 'Property Ladder' presenter Sarah Beeny helpfully launched a dating website with a difference. Sarah, of course, is best known, among other things, for such helpful advice as whatever, under no circumstances, put a loo in your kitchen when redeveloping your home. Who would do this? The answer sadly (perversely?) is too many people. There must be like a society or something. Better still, on a recent show she advised one woman that really it was probably not much of a hot idea to turn a four-bedroom house into a 10-bedroom mini bedsit ghetto. I mean who would have guessed? The best thing about her show is that these mindless loons usually ignore her advice and can't quite understand where they went wrong. You know, like what's planning permission anyway? Personally, I have found that no end of viewer interaction, also known as shouting at the TV screen ("OMG, how is it possible to be so stupid"), works, these people cannot be saved but really it's a great way of blowing off steam. Such inexplicable lifestyle choices come up in the people our friends and we go out with and sometimes similar harsh advice is needed. Although I try not to shout. I, for instance, am always offering helpful advice to my friends on the people they date. Adam, for instance, likes to date crazy foreign women or rather these are the people he somehow ends up dating. I think the two are related. Although to be fair, he did correct me on this earlier this week and pointed out that really he isn't prejudiced. "It's not just crazy foreign women, it's crazy English ones as well." It must be like having a Gaydar, but attuned to the unstable, you know, like an insaneometer or something. "Beside they don't appear unbalanced or disturbed it's only when you get to know them." But that's kind of like a lot people really isn't it? Susan, for instance, constantly dates people with unfortunate names (I know pot kettle et cet) called Robin (numbering two) and Jeremy who are all former public school boys. These relationships never work out and I tell her regularly that under no circumstances should she date anyone called Robin or Jeremy. Although she's told me to stop shaking her shoulders when I do this, which is fair enough. I'm worried that one day she might meet the Jeremy I shared a house with at Cardiff. When we came home from University one day he had taken all the sharp knives and stabbed them into the underside of the kitchen cupboards, which was sort of disturbing like The Shining had come to visit and had forgotten to call ahead. As one of my other housemates remarked at the time, "That's definitely the start of something". Susan has not been out with anyone for ages. She's gone all recluse like. It's swings and roundabouts. Earlier on the year, she was in like a dating frenzy, if that's at all possible, and talked about great lengths about "dating momentum". I, she told me, had none, which was true. I'm just not momentum-type guy, but now Susan has none as well. She's gone all Austin Powers like and mislaid the mojo, which is when I was thinking this Sarah Beeny dating caper, Mysinglefriend.com, was ideal for Susan. The key to the Mysinglefriend.com is it allows friends to recommend their single friends by writing testimonials. You write a sort of online review of them and its aimed at those people who are turned off by traditional dating sites. I tell Susan about this, telling her that I could write an absolutely brilliant testimonial, so good in fact that she was bound to get endless amounts of dates. "But that sounds like hell on earth with fire and lots of brimstone." "You say that, like it's a bad thing?" "Seriously, the point is that I don't want endless amounts of dates." "Really? You haven't heard the best bit yet. You get friends to write testimonials. I'd be only too happy to write one." "Testimonials? That sounds...oh I don't know, like an awful idea, so what would you write? Not that I'm even slightly interested." See, I knew this would interest her. So I tell her what I would write. "Attractive acerbic witty brunette likes to get the last word in and not averse to the occasional put down. Interested in French film, lit and skiing. Can even snowboard. Best suited to someone who does not get unduly upset by people regularly hanging up on them – what do you think?" "Who on earth would apply to an ad that like?" "Oh I would definitely reply, I'm completely immune to the whole telephone hang-up thing." "Oh that's very funny. Besides, you can't ski." "True, which must be why we don't go out." "Gord there are many reasons why we don't go out, but really that's not one of them." Okay I really wasn't going to say anymore on the subject, but I guess it's sort of unfair to leave anyone who's half interested hanging like that as to what happened after the difficult third. The difficult third, of course, turned out to be less difficult and more…oh what's the word acutely embarrassing? Something like that, but it was all of my own making. I know I acted kind of surprised, but I've written about a lot of people over the last couple of years and this was the first time that it came back to bite me so to speak. So after the third there was a fourth. We swapped the warm Wednesday in Soho for a rainy Saturday in North London. It must have been the rain, it fell for hours, but everywhere was stuffed and boisterous. Having started in the Dairy in Stroud Green and decided that the post football (England 2 Poland 1) stag party was too much, we ended up in the always-eclectic Faltering Fullback and briefly shared a table with huge psycho guy, his very camp friend and an Elvis Costello look-a-like before moving. I still feel kind of bad about accidentally half stealing the old guy's table. He was gone for ages, his drink was cleared away, but he looked dismayed to return and find no pint, no seat and left with the parting words: "They're good people in here", which I think looking at us he was less convinced of. The conversation tripped along in a way that I can't remember at all what we talked about other than another drink and then another was a good idea. I'm pretty sure that's a good sign. We went back to hers had some green tea, although more antioxidants were needed for the social smoking that had just taken place, and then I went home. There you go fourth date, if in scant detail, and like so many things in life there's no definitive answer. Just lots of questions, small questions really, and maybe just one. How did it go? And really, you know, I wish I could tell you, but really I have no idea. I never had an idea. Kind of annoying, I have to say. Anyways, I go out with Susan after this to see some movie preview, which I don't end up seeing, but it's a long story that involves lost key and a builder and…, but we are early and we end up in the pub before hand where we play quiz Gordo. "So fourth date? How did it go?" "I'm still ruminating on this." "Yes, I'm like a ruminator like guy." "Well, how do you think it went?" "Well I think it went okay, but I always think it went okay. And lets face it, this hasn't always been the case." "True, lets look at it another way. Did you have a good time?" "You think so? Did you do anything stupid?" "Mmm, let me think, how are we defining stupid?" "Gord did you do anything stupid?" "Not strictly? How about less strictly." "Well I bought her a book." "A book? That's kind of unlike you. "I know. What can I say?" "How long for three weeks." "That's a holiday, so what about a fifth date?" "Well I hope you got here a good book," Susan says. So here's the thing I have a bit of a problem. Hold the laughter. Seriously, it's the difficult third date thing again. I kind of got rumbled. Okay not kind of more like very much so. I mean who would have guessed that would ever have happened. The idea here is generally that what I write is mostly not read by the people I'm writing about, which is best. If my mother ever read this, I would be in a world of trouble. So difficult third date (DTD). I went to the Ashtanga class and managed not to fall asleep at the end and off I headed into Soho. To be honest it started out kind of well; what I mean is that she turned up and apparently the turning up is always a good sign. So we're standing there and this being last Wednesday, a particularly fine, balmy even, warm October evening, the kind that that gets people excited and talk turns to Indian summers and the like, and every pub in Soho had a street-side crowd as people enjoyed the weather that was at least as warm as the beer apparently used to be. I digress, you know a little. We're doing that thing and talking about work. More specifically, awards ceremonies. She was up for a couple of those nice Campaign Media Awards and Brand Republic was nominated foo two AOPs -- don't worry I don't know what they are either. Besides we were robbed -- literally as it turns out -- and lost out. "So what awards are you up for?" I tell her that we've been nominated for best editorial team and best business site. Blogs? Did you see that? It was like a huge roadside 96-sheet poster of a clue that really all was not so secret in the world of blogging about your dating life like it's CNN. So obviously being such a big clue I missed it. It's only the huge stuff, I miss, I swear. I did twig something, but really I put it down to coincidence. I did for a split second think about saying something, but I thought really it will be too difficult to explain. Besides I thought even people in media agencies have heard of blogging, you know finger on the pulse and all that. Dinner ensues. Andrew Edmunds is fully booked, boo hiss, but the place directly across Lexington Street, Aurora, has been turned into a carbon copy except in red. How handy is that. The food and wine passes pretty much without incident as far as I can tell. Besides if anything really big had happened I would have missed it, but hey life is in the detail, or some crap like that. Afterwards we're having a post dinner drink and she's venting about some work related thing as we're all apt to do once in a while when she says this. "I should be doing other things, like write a novel." "Really? What would you write about?" "Oh, I don't know, difficult third dates." I could have choked on my G 'n' T at that point. Talk about busted. This must have been, I thought, just what they really meant about DTD's. Needlessly to say I apologised profusely, as you do, and she was more amused than majorly hacked off, which meant the evening ended kind of well. I'm just going to stop there. I could write more, but somehow I'm thinking it's not such a good idea. I could start to talk about the fourth date, and I'm not sure what you call that? Is it the tricky fourth, the significant fourth? Whatever. All dates are difficult. I'm just going to have to find something else to write. I've heard of the difficult second album and the difficult second novel, but to be honest not having a first album or novel to my name I had never really given either phrase much consideration until Adam opened his mouth. "Third date? That's practically a relationship for you?" "Yeah, I know, but so far so...errr disaster free." "I know, but I hesitate before saying so far so good, as well it's kind of impossible to tell what the other person is thinking." "Now you face your greatest challenge..."
"My greatest challenge? What are you like Yoda?" "I'm talking about the difficult third date." And there it was. A phrase I had never heard of. The difficult third date. Recently to get as far as arranging a third, let alone, actually going on it is a bit of a novelty. I'm usually done and dusted 45 minutes into the first date in my own version of speed dating. So having set up a third outing I was not really feeling any trepidation about the event, until Adam piped up. "What do you mean difficult third date? I've never heard of that. I thought the second was always the difficult bit, you know, like novels and albums." "No, it's the third. By that stage you've made it through the first get to know you date, the second where you just about recognise each other and then it's the third." "The it's the third what?" "Well you might find conversation runs dry?" I had never even considered this. I never think it will run dry, although that's not to say it ever hasn't, but so far not a problem. Besides when it's looking doubtful I wave my arms around a bit. That always helps. Okay, so now I'm a little nervous as if dating wasn't a nervy business to begin with. I decide to ring Susan for dating encouragement and complain about Adam's gloomy take on things. "No, I've never heard of it," Susan says. "That's what I'm talking about. I knew there's no such thing as the difficult third. It's as if I don't have enough dating worries to consider." "You have dating worries? Such as what?" Well I'm not really sure I should be admitting this, but hey, that's never really stopped me in the past and that always worked so well. "Well, I was sitting there thinking the last time we went out. That really she should be going out with someone whose better looking and perhaps wittier." "Oh no, really? That's not good." "I know, but I couldn't help myself, but worse still then I thought really I don't think she's all that interested. Maybe I should just dump her first and get it out of the way." "Really? You thought that? Like you're Self Destruct Guy. Finger on the wrong button." "That's me SDG, finger on the wrong button guy like Dr Strangelove goes dating." "Oh I had another couple of drinks and stopped being stupid." "Yeah, but for how long for?" "Oh until right up to the moment where I start the difficult third date." "But I thought you said you didn't believe in the DTD." "I don't, but now it's in my head. It's no longer the third date it's like the DTD." "Well try not to get trigger happy."